Now, it’s not saying that a 4.6 40 yard guy WILL run 48 flat for 400m, though funnily enough, my 40 yard dash was 4.6 and I ran 48.36. It’s saying a 4.6 40 yard dash has the POTENTIAL of running 48 seconds for 400 meters based on raw speed. As Jared Deacon nicely pointed out, speed is the key… your 400m is based on your 200 time, your 200m is based on your 100 time, your 100m is based on your 60 time, your 60m is based on your 30 time. Or 40 yard or 36.6 meters. The following chart are National norms using hand times for 16 to 19 year olds. Where do you rank? What is your best 40 yard dash time and 400 meter time? How accurate is this formula? That is just another conjectural, theoretical model that is CRAP! In the first instance, 40 yard dash times are universally INNACURATE unless they are extrapolated from a fully automatically timed race (FAT). If you are referring to NFL “times” or other informal clockings, that is pure hyperbole and FICTION. In the second instance, the 400 meter race has a large component of fitness (stamina). This is something that can be acquired through training. That is how Jeremy Wariner can run faster 400 meter times than Tyson Gay–43.45 seconds as compared to 44.89 seconds, (although not Gay’s specialty). Butch Reynolds and Lee Evans were not regarded as “speed burners”, but they were among the greatest 400 meter specialists of all time–through stamina. Let me give you another illustration of how fitness or a lack of fitness can determine one’s 400 meter potential. Usain Bolt has a PR and world record of 19.19 seconds for the 200 meter dash. By any reasonable calculation, he should be able to run 2 (20.7) 200 meter segments, if he were fit. This would result in a phenomenal time of 41.4 seconds for the 400 meter race. You, I, and the readers know that is not going to happen because Bolt hates the 400 meter dash and the effort required to excel at it–notwithstanding the advantage of supernatural speed. I believe if you read transfer of training if would be better to go just above or below to get close to the predictor of times. As for potential in the long run is truely anyones guess. As kids develope on many different levels. Am I the only one who thinks the chart is a little “harsh”? 4.3-4.4 is only average? As a coincidence, the formula actually worked for me. I ran 4.61 electric for 40 yards my sophomore year of college and ran 48.4 my senior year. I feel I should have run 47-mid or better, so I definitely agree that the 40-yard predictor is just a guess. I would have to agree with the first comment as this just does not seem to add up. I feel like you find a few athletes who this works for but you will find a much larger percentage that is way off. The 40 is well the 40, it is a test that is used in football but does not tell much about what a football player can do never mind what can be done in a 400. Everyone is entitled to their own opinion. There are two great DVD’s on training the fron’t end of the race first,one by Toneys Wells and Caryl Smith, their DVD can be found at. http://www.track-tech.com A 4 dvd set for 30.00 and the other by William Freeman formal usatf chairman. You can find Freeman DVD at championship production. You guys have problems. You talk as if you know everything, but I’m willing to bet you haven’t produce anything. And if you have you only want the elite athletes.I have been coaching track and field for the past 7 years and I have discovered a workout that really works and the results for the 100 meters is 10.50 or better in 6 months and 21.15 for the 200 meters.If you have a guy that runs 11.2 and can bech about 200-225 he should be able to run these times. I have seen and heard of guys like you that dispute everything. I have been with the so called NSCA and what ever certification you want to call it, level 1-3 usatf and they are funny. Lot of paper work and nothing else. I wish they had a contest to see who could produce the fastest boy sprinter in 6 months and let all the athletes have equal times and ability, I would make you guys look like a fool! @Money – what are you talking about and why are you so angry? I’m not sure why you seem to be talking smack when it doesn’t appear that you have been called out by anyone. Just curious, I don’t really understand your post beyond the fact that you have been able to coach some kids to run fast and apparently the rest of the world has not. Sorry, just dissapointed with all this stuff about why would you call the 40 meter yard dash crap or fact. If you as a coach don’t believe in the 30-40 training theory then say it! In the above article,these are elite athletes! these are not club or high school athletes. When training 400 meters you have many parts of the race you have to train. When training for the 400 meter dash, many coaches train different.Some train the anaerobic alactic system first and some start with long anaerobic endurance system from 150-600 meters. As a coach, I have found it much easier to start with anaerobic alactic and work around until I reach my goal of training either to 500 or 600 meters in distant. When I train anaerobic alactic,I train from 10-80. As a formal coach, When training anaerobic alactic first, It helps the sprinter to develop proper running mechians and I have never had a sprinter to pull when training from short to long. It’s interesting but probably only useful for athletes who have the desire, mental toughness and desire to run the 400 in the first place, which greatly reduces its value as a 400m time predictor. After if you’ve spent more than say 2-3 years competing as a sprinter at the high school level (let alone beyond that), you’ve met those athletes who have great speed for the 60m during the indoor season but are TERRIBLE at the 200 OR maybe they’re good at the 100/200 but just fall apart over the last 1/2 of the 400. And we’ve also met the guys who have good speed who say are jumpers or 100m guys, etc, and they run an amazing 400 the first time out, because they have great natural endurance and have the toughness component. Speed is a huge component, sure. But without the stamina (and to some degree you’re born with that potential wise), and the raw drive and toughness you still won’t run well. Plus you have to figure out how to train that particular athlete. When I was in HS, College and now in the Masters ranks, I seem to benefit from focusing on my long sprint endurance first and the doing the short stuff. I tried to do things the opposite way when I first came back (to masters), and just succeeded in hurting myself. So I trained like a 400/800 guy for a bit, came back and had a huge PR in the 200 – go figure. 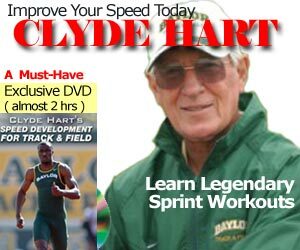 According to Clyde Hart Michael Johnson rarely did speed work and much of his routine looks like 400/800 or at least a 400mh. So while it would be a good predictor for a 400m specialist as far as top potential, I think it’s rather limited for sprinters in general. In the end I think the 200 and really the 300 are better predictors, because as any competitive sprinter knows all sorts of things happen from 60-100-200 meters, which really determine what kind of sprinter you are. Two guys could have similar 200 times, but guy A finishes strong and guy B has been hanging on for the last 60 meters of the race. Chances are, guy A is gonna run a better 400m all things being equal training wise. Hello Aaron, 50.32 is a good time for 400 meters if it was eletronic time. Yea it was electronic but i feel i need to be in the 47s or 48s as a junior do you have any tips or strategies for me to get there? Do you run in california? if so,what school.What was your best 100 meter time? what was your best 200 meter time? It wouldn’t do me any good to give you any tips because when you start training with your coach, he is probably going to do something totally different and that will cause confusion between you and him. Also,it is very disrespectful for any coach to interfear with another coach athletes even if they are not in training season. If he told me I could, then I would help. Be patient,seems to me that your coach hasen’t done a bad job. Are flexable? are you in the weight room, these are things you should be working on now. In your regular season, you should run as many 4 x 100 relays,100-200 races as possible. What school do you run at, if you don’t mine telling me. Im in the northern Sacramento area. What’s your 1 rep max for the bench press, cling, and squat. I think I would have to call it crap! How many football/track guys with (great 40 yard times) run a good 400 meters? Hell most coaches, can’t get them to run a 350m TT. The (400 meters is mostly a speed endurance race), that is why most sub (44)400 meters runners can run under 1:15 in the 600 meters. What’s the big deal with numbers? Just run. If you’re fast, you’ll know it. If not, train and you will be faster. When I was a kid we ran from dogs, chased kids on bikes, ran from the car we just plugged with a snowball, played hoop, football, or whatever, chased a frisbee or fly-balls for hours, ran hills, chased chicks, ran from the police, played ding dong ditch, jumped in pools and ran, climbed fences trees, etc. We did absolutely no endurance work, no strength work, no work at all. Just had fun. And during track, we kicked axx. I am not sure whether the table is for 30 meter time or 40 yard dash time. It seems these numbers are very fast for 40 yard dash. After reading the comments, I double checked the reference and I think they made a mistake. They have the exact same table for both 30 meters AND 40 yard dash (~37 meters) test. So it’s possible the chart was for 30 meters. It seems to me that it would be much more accurate to find the coraltion between 40 times and 400 times if you took elite 400 meter runners (who are close to their “potential”) and time them in the 40 yd dash…….I would asume that a collegite athlete that can run a 48 or 47 400 could easily run a 4.8 or 4.7 40;at the same time im sure their are plenty of high school kids that can run a 4.6 40 that could not run better than a 50. or 49. quarter. Maybe after years of training to carry their speed down the track for 400 meters to get to their potential 400 time.